A single and multi-layer solution for large commercial and industrial roofing, residential buildings, large metal structures with and without insulation, exposed waterproofing systems mechanically fixed, roofing with photovoltaic (solar) panels, waterproofing foundations, retaining walls and large structures in general. 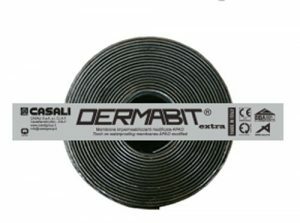 Casali Dermabit Extra is manufactured using polyester with high mechanical properties and excellent dimensional stability. This APAO membrane uses synthesis engineered polymer compound to ensure a thermal operating range of -25°C/+150°C, high elasticity, excellent resistance to atmospheric ageing, perfect joint seal and excellent adhesion to any type of deck, high resistance to mechanical and thermal stress. The range of Dermabit® membranes are certified by the most prestigious certification institutes such as BBA, ITC, BRANZ and have been used for more than 40 years in more than thirty countries all over the world.